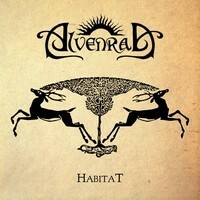 Dutch Folk Metal Duo ALVENRAD and all their guests make up one hell of an elf army with this album (Alvenrad means sun referring to the sun wheel of elves). Released through Trollmusic, this album has a ton of sections for all sorts of metalheads to love. Specifically when it goes Black Metal. Right off the bat you'll realize its all Dutch, throughout the entire album I don't remember hearing English once, so if you don't like knowing what they're saying you might want to skip this album. The song titles should have given that away though, I'm not even sure how to pronounce what I'm listening to anymore. If you're here for some good old Folk Metal awesome, this entire album is full of Folk Metal, but there's a rare surprising treat to this album. In some songs most dominant of all of them is "1911" the band goes Black Metal. With not as heavy instrumentals as Black Metal normally has, but some of the best vocals you'll hear this is an amazing treat to those who enjoy it. "Zwartwildernis" is a fun song, with a lot of basic instrumentals but Folk heavy keyboards and some flute in the background to cheer you up. The songs are pretty fast paced throughout the entire album, putting harsh and clean vocals, Black and Folk Metal, and even a ton of different solos. For fans of Folk Metal for sure but if you wanna take my word for it check out "1911" for some incredible Black Metal that shows up most modern Black Metal bands. ALVENRAD have a lot to them, Prophecy Records picked up an interesting band. They're future as a band is in the dark though. Will they stay as they are or will they drop with Folk or Black Metal? Check them out and voice your own opinion.